Photograph of Mt. Vernon, Virginia, and Washington as a Farmer at Mount Vernon, by Junius Brutus Stearns, 1851. Courtesy Virginia Museum of Fine Arts, gift of Edgar William and Bernice Chrysler Garbisch. GW's lifelong passion was his plantation, and he was very anxious to get back to Mount Vernon and return to the supervision of his five farms there. He spent the last two years of his life making improvements to the estate. Until his death in 1799, Washington required his estate manager to write a weekly summary of the preceding six days' activities. Known as the "Farm Reports," these documents provide an invaluable view of a working plantation and its residents. 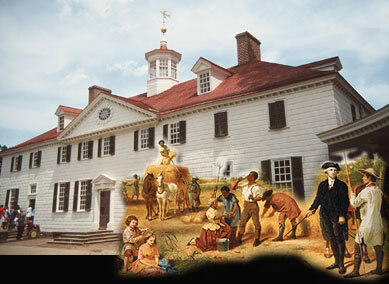 In addition to recording meteorological information, livestock counts, quantities of various products harvested, and notes on maintenance and improvements, the Farm Reports give us insight into the life of the slaves at Mount Vernon. In particular, these documents detail the work patterns of slaves, including the tasks at which they were employed and the number of days spent at work and in illness.